MANY OF you might wonder and think, where is Mary? What is she up to? Well, I am alive still in Jeju making more plans for next year what to show in art world. Living as an independent curator is not such an easy thing, but it's also quite adventurous as you can tell if you follow where I am about these days. I am still travelling around mainly between Jeju and Seoul these days, but sometimes in Europe, too. So, this year I planned to have only two things: One-the residency at Raumars in Rauma, Finland and Two-the residency at Gasiri Creation Center in Gasiri, Jeju, Korea. The plan expanded to the residency at Polymer Culture Factory in Tallinn, Estonia, visiting Venice Biennale, Dublin Contemporary, and helping space O'NewWall to connect with international curators who visited Gwangju for the3rd curator's course. I don't know all of you, but I appreciate some of you who contacted me or visited space O'NewWall and say hello to let us know what you are interested in. Well, I have been working independently in the name of 'Mary Art Project' but as you know I have been collaborating and helping my friend, Juno Seo's space in Seoul. He wanted to collaborate with international curators, who are interested in Korean art scene. His idea is a bit different from mine towards curating, however, we consented to collaborate and expand our curating realm broader in many aspects. He has been interested in getting involved in the Korean society with art and curating with strong theme to speak up about it. One of his recent curatorial work is 'Peace like River' which is twisting the huge project by Korean government on four big rivers in Korea. You can tell his curatorial view is quite different from mine, but both of us agree that we need a good platform for young curators who want to show their ideas without thinking too much about other obstacles from our surroundings. 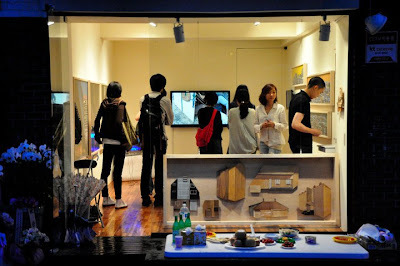 Recently many alternative spaces and non profit art spaces closed down in Korea. Last month, Space Bandi in Busan finally closed, too. A lot of independent curators now face to 'Nowhere to exhibit'. Many art galleries say art market has come down again in Korea after the heat of market has gone. Getting national grants is too competitive to get even a small one these days. Yet, what is so real? Are these really creeping under your skin? Or is this just about rumors and surface? All the plannings for 2012 is still going on. A lot of deadlines for public grants were last week. I have applied for several, too. While I was applying for these grants, I was thinking that I needed more inspiring ideas to plan better exhibitions. O'NewWall has such a small space, therefore it needs such a strong impact and concentration in a show. If you visit Seoul, come and visit O'NewWall. They will have a new wall for your creative ideas if you are a curator who has got nothing but passion.